The accurate analysis of gold and other precious metals has become progressively significant because of the value of these precious metals. This is particularly important for processors and resellers of these metals. Gold jewelry and gold scrap are usually collected from jewelers, consolidators, pawnshops, medical and dental offices, and even electronic manufacturers. The product is either re-sold to the consumer or processed to recover the precious metals for use as a raw material in the manufacture of other products. Energy Dispersive X-Ray Fluorescence (EDXRF) challenges the traditional fire assay process for examination of precious metals. It is rapidly becoming the preferred technique in the precious metal sector as it is a nondestructive method and thus used for applications where there is a necessity to maintain the sample’s integrity. All material remains undamaged after examination allowing for complete recovery of the precious metal content. Raw materials in the form of scrap and jewelry besides products such as solders, alloys, gold-bearing alloys, and sterling silver are tested for gold content (karat) and to confirm composition. An initial scan of various concentrations of elements in a refining lot is easily achieved through this method. 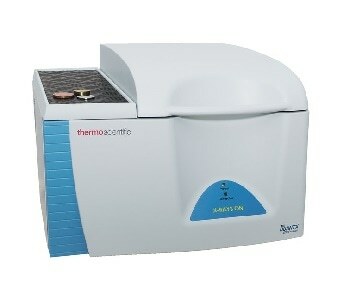 The Thermo Scientific™ ARL™ QUANT’X Energy Dispersive X-ray Fluorescence Spectrometer is an advanced elemental analyzer delivering the ultimate in accuracy and precision required in this industry. The technology is based on the EDXRF principle allowing for the instantaneous measurement of the emission lines for all elements from sodium (Na, Z = 11) to uranium (U, Z = 92). The Silicon Drift Detector (SDD) with an area of 30 mm2 is well suited to detect precious metals. The ARL QUANT’X Spectrometer along with a sample-imaging CCD camera and modifiable X-ray beam collimation enables placing of small pieces of jewelry for effective excitation and analysis. The system integrates all the analytical characteristics of selectivity and sensitivity integral in a bulk-analysis spectrometer with the sampling flexibility generally seen in micro-analyzers. The operator can picture and locate the sample before examination thus aligning small samples or features to enhance the accuracy of quantitative and qualitative analysis. The ARL QUANT’X Spectrometer realizes greater precision and sensitivity via source-tuned excitation of the sample to fluoresce just the elements of interest. The system provides a nearly limitless combination of excitation voltages (4–50 kV) and many primary beam filters (nine) for ideal background control, which enhances elemental sensitivity and decreases background so as to provide improved performance. As illustrated in Table 1, two conditions were used to gather the spectra for gold and related alloying elements. The tube current is automatically tweaked to enhance the input count rate. The total counting time for each analysis is 8 minutes and all measurements are carried out in an air atmosphere. All samples and standards were examined as received. The samples and standards were positioned in a standard XRF sample cell equipped with a 4 μm polypropylene X-ray support film for presentation to the spectrometer. A Fundamental Parameter (FP) method was applied to perform the calibrations. This technique is added in the basic quantitative package provided with the ARL QUANT’X Spectrometer and yields outstanding results. The FP technique determines a relationship between spectrometer reaction and element concentration based on a standard set. As the name suggests, the software uses a range of important parameters including the primary principles of X-ray absorption and emission to correct for matrix interactions. Any mixture of standards ranging from matrix matched to pure element standards can be made use of by the FP software for calibration. The standards used in this application are illustrated in Table 2. Figures 1 through 3 display the regression curves for Ag, Cu, and Au, the key components of gold jewelry and alloys. The plots show a good correlation between the specified elemental concentrations and the calculated concentrations using the Fundamental Parameter calibration technique. Figure 1. Regression curve for copper. Figure 2. Regression curve for silver. Figure 3. Regression curve for gold. The main goal of a sample evaluation is to verify that the repeatability and sensitivity of the instrument match the application requirements. Ten replicate measurements of a jewelry sample were performed to gauge the reproducibility of the technique. Table 3 shows the mean concentration and 1-sigma Standard Deviation of these measurements as well as the certified value of the sample. Measurement times identical to the calibration were applied. The results revealed in this research show the excellent performance of the ARL QUANT’X EDXRF Spectrometer for the measurement of precious metals in gold jewelry with primary beam filters for background control, an efficient SDD, a high-powered X-ray tube, and flexible fundamental parameter software. The ARL QUANT’X Spectrometer offers the precision and accuracy required in the precious metals sector.